Excellent read and information regarding the pros & cons, very helpful indeed as I am in that stage of pondering to be my own publisher or not. 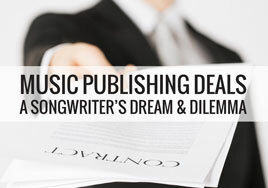 As interest builds in the material, a songwriter may find it easier to give up a smaller percentage to have administration duties taken care of, etc. for him to live with less stress and more time to write. I am very new to all of this & I need all the info that I can get. I’m interested in not only publishing my material but also performing it. I want to know all I can about protecting myself and also my material. Where can I go to find the info I need? Are there books that I can read to help me? I’m using my cell phone to get what info I can but it is limited. We have a number of articles on copyright, which sounds like what you’re looking for. You can search our site for that term to find the articles. thank you so very much for all your helpful info! do i have to do a seperate copywright for every song i write? Jennifer, the copyright website states that “a collection of works may be registered with a single application if… the collection is made up of unpublished works by the same author and owned by the same claimant”.